Identifying which campaigns and channels have influenced an opportunity is a key piece of information to see which marketing campaigns are the most effective. In this tutorial, I’ll walk you through how I use Salesforce campaigns in Pardot to track campaign influence. If you already have a standard naming convention in Pardot, great! You can use the same naming convention for you Salesforce campaigns. Otherwise, here’s an idea on how you can set it up. Standard campaign statuses are essential to have consistent reports within Salesforce. Here are some suggestions on what campaign types and statuses you might want to use. Once you have figured out what your naming convention, campaign types, and statuses should be it’s time to get started with the Salesforce setup. First, we need to set up 1 campaign for each campaign type. These will act as ‘templates’ for all your campaigns going forward. When you create a new campaign in Salesforce, you will ‘clone’ one of the campaign ‘templates’ instead of creating a new campaign each time. 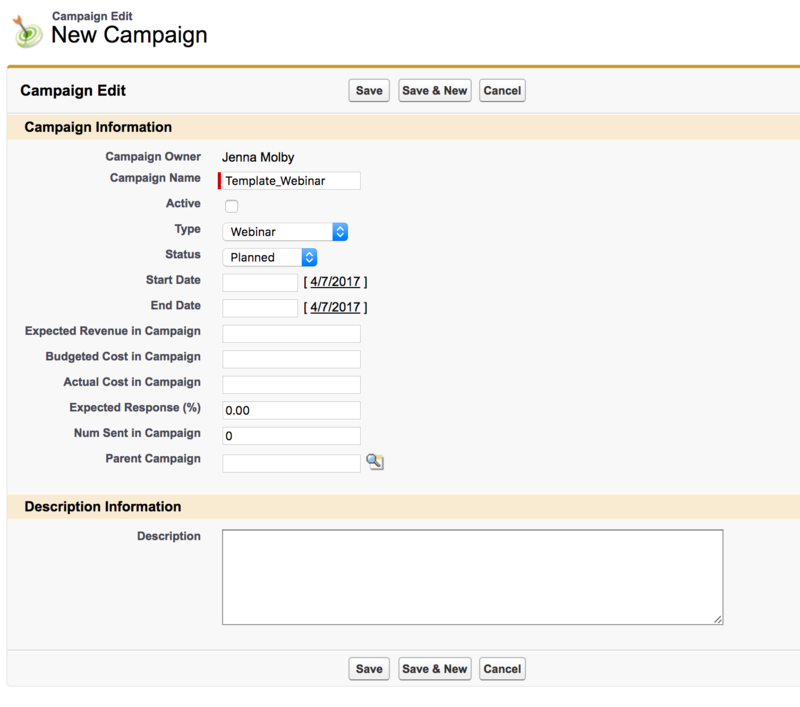 This will ensure that all you campaign statuses are consistent throughout all campaigns and make reporting MUCH easier. Create a campaign and give it the a descriptive name to indicate the type of campaign and that it’s a template. Go to the campaign and click advanced setup to create and modify your campaign statuses. Add each one of your statues and select one or more statuses as ‘responded’. 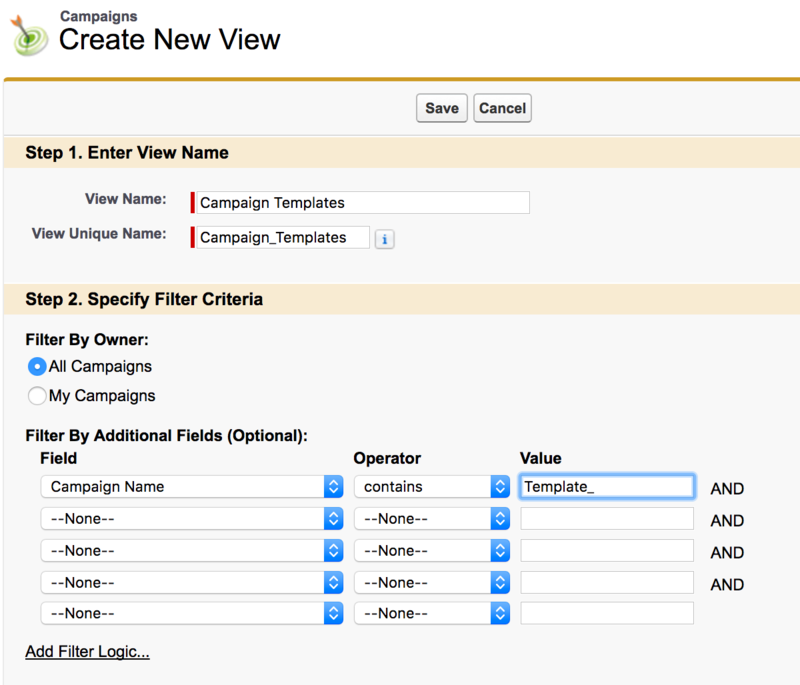 Once your campaign templates are setup you can create a new view, so you can easily locate your campaign templates. 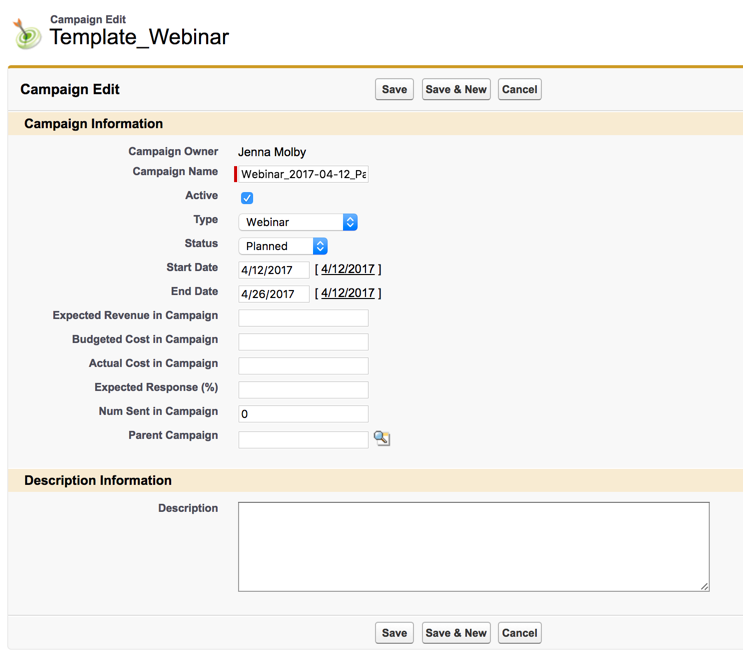 Find one of your campaign templates, click on the name and clone the campaign. Name your campaign according to your naming convention and update the rest of the fields. Now that you have everything set up in Salesforce, it’s time to use these campaigns in Pardot. Prospects are not automatically pushed into a Salesforce campaign. They will only sync to a Salesforce campaign if you set up an automation rule, segmentation rule, completion action, an engagement or drip program. This Pardot knowledge article explains in detail on when to use each one of these methods and here’s a breakdown of which method I recommend for each campaign type and status. Update by creating an automation rule and include everyone that’s in your emailing list. You can also go to Reports > Marketing Assets > Emails > List Emails, scroll down to the total sent and click on the link. Select all the prospects and add a tag to them. Then you can create an automation rule based on the prospects who have that tag and sync them with your Salesforce campaign. Update using a completion action when scheduling the email. Setup custom redirects and use completion actions to update the Salesforce campaign status to clicked. Use an automation rule to track who attended a tradeshow. Dependent on how the registration for your tradeshow is set up. You might use a completion action on a form or form handler to manage this status update, or have an automation rule running if you’re uploading a list of prospects. Dependent on how you manage badge scans at a booth. Most likely you will need to use an automation rule to update the status to visited booth. An automation rule will need to be created to update the status to no show. Use a completion action within your registration form or form handler to update the Salesforce campaign status to Registered. Use an automation rule to update the statuses to attended or no show. Campaign ROI Analysis Report: How are each of your campaigns performing? Campaign Call Down Report: Shows all the members of a specific campaign. Campaign Member Report: Shows all the members of your campaigns. Campaign Member Analysis Report: Who has responded to your campaigns? Campaign Leads: Which leads have been marketed to in the past? Campaign Contacts: Which contacts have been marketed to in the past? Campaign Revenue Report: Shows the revenue generated from your campaigns. Campaigns with Influenced Opportunities: Shows the opportunities influenced by your campaigns. This is great information, thanks for sharing it!! I think you already answered it on the first comment, but is the main benefit of using Salesforce campaigns is that you can associate multiple events/touchpoints to one contact, whereas Pardot limits you to just a single campaign? And then I'm assuming there is better reporting in Salesforce if we're trying to connect opportunities to campaigns? I was just digging around and it looked like I couldn't run an opportunity report against the pardot campaign field. Hi Jay, that's correct. Pardot campaigns are for tracking only the first touch whereas Salesforce campaigns can be used to track all marketing touches. There's also better reporting in Salesforce to connect opportunities to campaigns. Hi Jenna, Are you using salesforce campaigns to track last touch as "marketing generated" opportunities (I believe that's how SFDC sets it up by default)? The influence report is good, but what's the best way to track whether Marketing sourced that opportunity? Hi Jenna, Great post! Super useful. I was wondering whether a child campaign in Salesforce can be updated in Pardot as well? Do you have any suggestions on how to organise campaigns in SF vs Pardot, since Pardot does not allow hierarchies in campaigns. We are thinking of organising our SF campaign hierarchy by Channel with each channel containing child campaigns (which are the tactics or actual creative campaigns for the channel). For eg. Google Display ads and Facebook ads will both be parent campaigns each of which might have for instance a remarketing child campaign. In this case does it make sense to organise Pardot campaigns by tactics for eg. a remarketing Pardot campaign so we can get different kinds of useful reports in SF and Pardot (by channel in SF and by tactic in Pardot). Also if a prospect interacts with several campaigns (for eg. GDN banner and FB ad) prior to submitting a form, how do we get the campaign influence prior to form submission into Salesforce? Hi Jenna. Thank you for this resource and the time you've invested in creating this encyclopaedia of useful operational marketing tips. I find that I am unable to add more than one Salesforce campaign completion action meaning I must choose between email opens/clicks/unsubscribes rather than having data for all 3 as I thought might have been the case based on your article. Is this the case and I've misunderstood your article? Thanks. Hi Tom, Glad you found this post helpful! You should be able to add more than one Salesforce campaign for a completion action.